An overhang in architecture is a protruding structure which may provide protection for lower levels. Overhangs on two sides of Pennsylvania Dutch barns protect doors, windows, and other lower level structure. 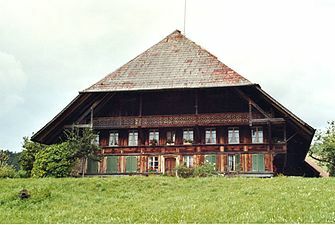 Overhangs on all four sides of barns is common in Swiss architecture. An overhanging eave is the edge of a roof, protruding outwards, beyond the side of the building generally to provide weather protection. 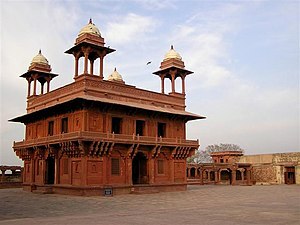 Overhangs are also common in medieval Indian architecture, especially the Mughal architecture (16th -18th century), where it is known as Chhajja, often supported by an ornate corbel and seen in Hindu temple architecture as well. Later it was adapted into the Indo-Saracenic architecture which flourished during the British Raj. Extensive overhangs are incorporated the early Buddhist architecture, seen in early Buddhist temples, later became part of the Tibetan architecture, Chinese architecture, and eventually the traditional Japanese architecture, where it became a striking feature. 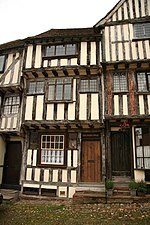 In late medieval and Renaissance Europe, the upper storeys of timber framed houses often overhung the storey below; the overhang being called a "jetty". This technique had been superseded by the start of the 18th century, as building in brick or stone became common. It was one of the most common features of American colonial architecture of New England and Connecticut, starting 17th century, which had an overhanging or jettied second story, which usually ran across the front of the house, sometimes around it. These are known as a garrison houses. 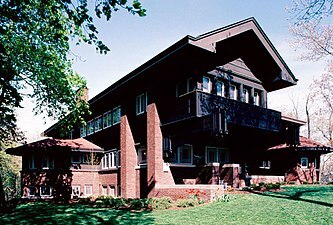 Then in early 20th century it was adapted into the Prairie School architecture, with architects like Frank Lloyd Wright, and thus made way into the modern architecture as well. An overhang may also refer to an awning or other protective elements. 15th century timber framed houses with overhanging jetties in Thaxted, England. Overhang of the Diwan-e-khas (Hall of private audience, Fatehpur Sikri, built 1570s, Mughal architecture. The late 17th century McIntire Garrison House in York, Maine. 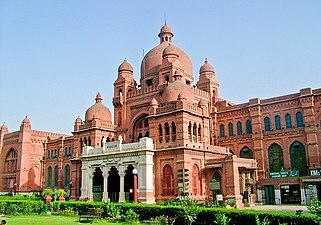 Overhangs of the Lahore Museum, Pakistan in Indo-Saracenic architecture, 1894. Emmental farmhouse with overhang reaching the ground, Switzerland. Overhangs of the Harold C. Bradley House, Madison, WI, by Louis Sullivan and George Grant Elmslie representative of Prairie School architecture. 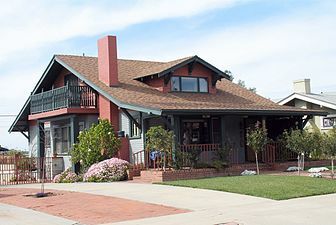 Deeply overhanging eaves in American Craftsman-style bungalow, San Diego, California, late 19th century. Darwin D. Martin House, Buffalo, New York with wide overhang. Frank Lloyd Wright, 1905. Barcelona Pavilion, with hovering overhang, 1929, by Mies van der Rohe, Modernist Bauhaus architecture. The Concourse, Singapore, featuring prominent overhangs, 1994. ^ Allen, Margaret Prosser (1991). "Hindu shrine in Muslim Rule". Ornament in Indian architecture. University of Delaware Press. p. 362. ISBN 0-87413-399-8. ^ Young, David; Michiko Young (2007). The art of Japanese architecture Architecture and Interior Design. Tuttle Publishing. p. 44. ISBN 0-8048-3838-0. ^ Gössel, Peter; Gabriele Leuthäuser (2001). Architecture in the twentieth century, (Vol 1.). Taschen. p. 67. ISBN 3-8228-1162-9. ^ Morrison, Hugh (1987). Early American architecture: from the first colonial settlements to the national period. Courier Dover Publications. p. 28. ISBN 0-486-25492-5. ^ Kelly, John Frederick (1963). "Chapter 5. The Overhang". 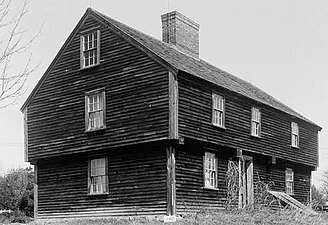 The Early Domestic Architecture of Connecticut. Courier Dover Publications. p. 61. ISBN 0-486-21136-3.